Local and remote staff connected for an all-staff meeting in San Francisco’s Presidio. Staff shared Year of Science reflections, celebrated last year’s successes, and kicked off the annual planning process for the next fiscal year. Wiki Ed staff attended the annual meeting of the American Association for the Advancement of Science in Boston. Director of Programs LiAnna Davis and Wikipedia Content Expert for the Sciences Ian Ramjohn discussed using Wikipedia as a platform for science communication with attendees in the exhibit hall and in a workshop with the Simons Foundation’s Greg Boustead and the Wikimedia Foundation’s Dario Taraborelli. NPR and Pacific Standard ran major news pieces about how assigning students to edit Wikipedia through Wiki Ed’s program provides much-needed media literacy skills for students. We announced a new Wikipedia Visiting Scholar, User:Czar, partnered with Smithsonian Libraries and the National Museum of African Art. Czar has already produced a number of high-quality articles about African art and artists. Ian Ramjohn talks about teaching with Wikipedia with a AAAS attendee. 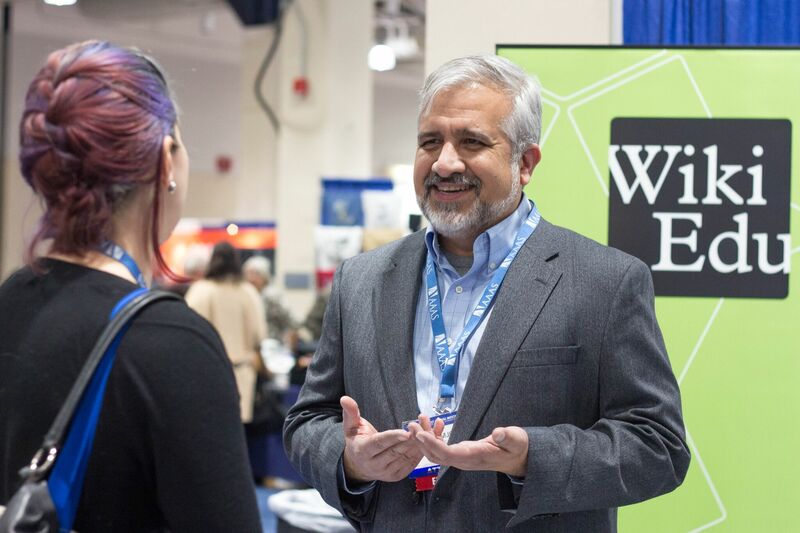 At this year’s annual meeting of the American Association for the Advancement of Science (AAAS), Boston played host to thousands of scientists, policy makers, and journalists. In a workshop at AAAS entitled “Mind the Gaps: Wikipedia as a Tool to Connect Scientists and the Public”, Greg Boustead of the Simons Foundation pointed out that the coverage of women scientists on Wikipedia is less complete than that of their male colleagues (and what coverage does exist tends to speak less about the significance of their contributions to science). When scientists assign their students to create biographies of women scientists, they aren’t engaging in activism; they’re merely working to ensure that the facts that are out there “speaking for themselves” are representative of reality. In the same workshop, LiAnna discussed the role that students can play in translating scientific knowledge into something that’s more understandable to general audiences. LiAnna and Ian also joined attendees in the AAAS exhibit hall, where conversations about using Wikipedia’s platform to communicate science were lively. Mark Sarvary and Kelee Pacion also presented about their experience in our program in their class at Cornell. As of February 28, we have brought 143 new courses into the Classroom Program for the spring 2017 term — 53 more than this time last year. The numbers prove our efforts to raise awareness about teaching with Wikipedia have been working, and we have been spent the month helping new instructors prepare their Wikipedia assignments. Students edited 2,630 articles, created 93 new entries, and added 554,000 words. As we approach the middle of the term, students are beginning to delve deeply into their Wikipedia assignments. They’re choosing articles to improve, drafting bibliographies, and making those first edits to Wikipedia’s main article space. We’re closing out February with 270 courses in progress, already just shy of the 276 we supported throughout all of last term. We expect to exceed our Fall 2016 record shortly, a feat we’re very proud of. As more students engage in Wikipedia-based assignments, they have the chance to participate in the production of public knowledge, and in doing so become more adept consumers of knowledge as well. They take on the great responsibility that comes with contributing to Wikipedia, and have the chance to produce work with a lasting impact. At the same time, Wikipedia gets better coverage of topics ranging from immunology to Hawaiian linguistics, and from chemical engineering to Renaissance art. In February, we again hosted Wiki Ed Office Hours. During this program, instructors were able to drop in and speak with members of the Wiki Ed staff about their Wikipedia assignments as well as learn what others are doing in the classroom. We’ll continue running this program throughout the term. This month, we also sent out the inaugural edition of the Wiki Ed Newsletter to both current and past program participants. Wiki Ed is engaged in a variety of programs, and we want to make sure that our instructors know about the many ways they can engage with us outside of the classroom. As the program continues to grow, we see the newsletter as a way to stay in touch with our instructors, even when they’re not teaching with Wikipedia, and to expand their involvement in the project of connecting Wikipedia and academia. At the end of the month, Classroom Program Manager Helaine Blumenthal and Educational Partnerships Manager Jami Mathewson visited Dr. Amin Azzam’s class at the University of California, San Francisco. As Amin puts it, his group of fourth year medical students are uniquely positioned to contribute to Wikipedia. Their knowledge is robust, and they are still able to communicate their medical knowledge to a non-expert audience. As Helaine conveyed to the students, hundreds of millions of people go to Wikipedia on a monthly basis for medical information, so their contributions could potentially save lives. We’ve been working with Amin since Fall 2014, and we look forward to a continued partnership as we attempt to improve medical content on Wikipedia. A student in Emily Sessa’s Principles of Systematic Biology class created Wikipedia’s article about bat flight. 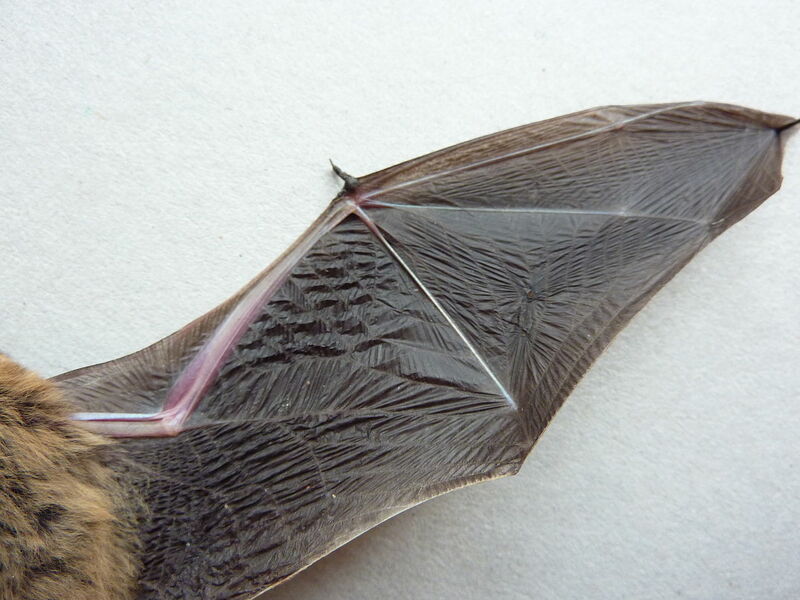 Image: Bat-wing underside.jpg, by Salix, CC BY-SA 3.0, via Wikimedia Commons. A zeotropic mixture is a mixture of components which have different boiling points. Separating these compounds through distillation is an important industrial application, and understanding the nature of these mixtures and their components is crucial for the design of the distillation columns used in the separation process. Before students in Elizabeth Nance’s Communication in Chemical Engineering class started working on it, Wikipedia’s zeotropic mixture article was short, saying little about the nature of zeotropic mixtures and almost nothing about their separation by distillation. A student in the class expanded the article substantially, adding not only sections on these topics but also ones on the use of zeotropic mixtures as refrigerants and cleaning solvents. Another student in the class has been working on the capillary pressure article, which was surprisingly short before they started editing it. In addition to fleshing out the theory and equations of capillary pressure, the student also added applications both in the petrochemical industry and in natural processes, such as the formation of needle ice. Other students expanded a range of articles including those on inviscid flow, eddies, and the enthalpy of mixing. One student created a new article on minor losses in pipe flow. Various insects have symbiotic relationships with fungi; many wood-boring insects, for example, depend on fungi to break down wood into something the insects can digest. Some of these carry their symbionts with them in a specialized structure called a mycangium. A student in Emily Sessa’s Principles of Systematic Biology class expanded the short article to add details about mycangia in a host of beetles and a group of wasps. They also added information about some of the types of fungi that insects carry in their mycangia. Bats are the only mammals capable of true flight. Another student in the class created a stand-alone article on bat flight. The article discusses topics including the evolutionary origins of flight, and the relationship between wing morphology and the ecology of various species. Other students created articles about Euwallacea fornicatus, an ambrosia beetle that carries fungal spores with it in its mycangium, while others created articles about Amoebidium and Paramoebidium, a pair of genera of unicellular organisms formerly known as protists. To many people, nanotechnology is something just this side of science fiction, dealing, as it does, with objects between 1 and 100 nanometers in size (or as little as a billionth of a meter). Students in Katherine Mirica’s Functional Nanomaterials class have been expanding articles in this area. One student expanded the nanofiber article, adding information about the history of nanofibers (they were first produced over 400 years ago), modern means of manufacture, and a range of applications including tissue engineering, drug delivery, cancer diagnosis, batteries, sensors, and air filtration. Nanobatteries are batteries made with of nanoscale particles. The existing Wikipedia article on this topic was expanded substantially by a student in the class, adding information about the advantages and disadvantages of nanotechnology in batteries as well as current and past research on the topic. Other students in the class created an article about the photolabile protecting group and made major additions to the articles on supramolecular polymers, molecular solids and 2D materials. 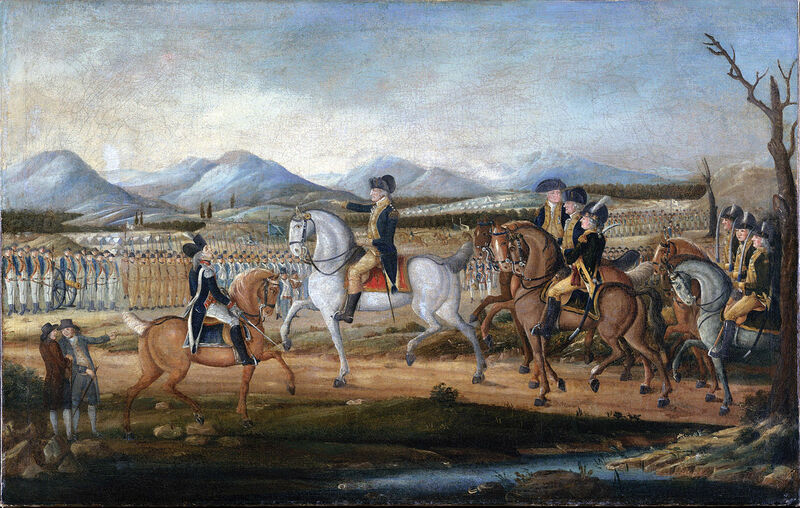 The Whiskey Rebellion, attributed to painter Frederick Kemmelmeyer. Community Engagement Manager Ryan McGrady spent February working with several new and prospective Visiting Scholars and sponsoring institutions. Ryan worked with our partners at the Association for Women in Mathematics to review Visiting Scholars applicants who responded to our January call for applications. The response to the call was very strong, and as a result we are looking forward to working with two AWM Visiting Scholars, starting in March. February also saw the announcement of a new Visiting Scholar with Smithsonian Libraries. User:Czar is a long-time Wikipedian with more than 70,000 contributions since 2005 and an impressive number of high-quality articles. One of the reasons we like the Wikipedia Visiting Scholars program so much is its ability to focus on a particular subject area on Wikipedia that needs improvement by forming a relationship between a Wikipedian and institution with shared interests. This is an excellent example of such a collaboration. Czar will be working with the Smithsonian Libraries and the National Museum of African Art to concentrate on African art and artists. University of Pittsburgh Visiting Scholar Barbara Page worked to bring the article about the Whiskey Rebellion, a tax protest in the United States beginning in 1791, up to Good Article status. It was also featured in the Did You Know section of Wikipedia’s Main Page with the fact “[Did you know] that only two men who participated in the Whiskey Rebellion were convicted of treason, but were later pardoned by President George Washington?” Barbara’s work on women’s health topics was also recognized in the Spring 2017 issue of Pitt Med magazine. George Mason University Visiting Scholar Gary Greenbaum added another excellent Featured Article to his impressive list of work with the Coinage Act of 1965, which was promoted this month. Finally, Czar, our newest Visiting Scholar, has already been very active in developing high-quality content. He worked to improve articles on Angolan photographer Edson Chagas and the National Museum of African Art, both of which reached B-class quality, and both of which are currently moving through the Good Article Nominations process. Working with media firm PR & Company, LiAnna did interviews with reporters from NPR and Pacific Standard, resulting in two major news pieces about how assigning students to edit Wikipedia through Wiki Ed’s program provides much-needed media literacy skills for students. The reporters also spoke to participating instructors in our program. The resulting press (especially the NPR article) was widely shared and resulted in several new instructors reaching out about potentially joining our program. Helaine and Ryan put together the first edition of the Wiki Ed newsletter, sent to past and current program participants. The newsletter is a way to keep in touch with instructors, share news about the Dashboard, highlight student work or other successes, and communicate opportunities to connect with Wiki Ed or to get more involved in the community of people who understand that Wikipedia belongs in education. We look forward to sending out newsletters on a monthly basis moving forward. In February, Product Manager Sage Ross kicked off an experimental grant-funded project with Agile Ventures, a nonprofit software development education community that focuses on building web applications for other nonprofits. With funding from a Wikimedia Foundation Rapid Grant, Sage is working with an Agile Ventures project manager to guide more new code contributors to the Dashboard development project and help them get started. The project will last for two months, with the goal of determining the potential for systematically working with the Agile Ventures community as a way to continue developing the Dashboard. Intern Sejal Khatri continued her work on user profile pages, rolling out several major updates that bring better cumulative statistics along with customizable bios to the user profile pages. See Sage’s profile, for example. Sejal also added a new visualization to course pages: an edit size graph that shows the magnitude of each edit to an article. To see it in action, visit the Articles tab of a course, zoom in on one of the edited articles, and click ‘Article Development’. We began beta testing a real-time chat feature on the Dashboard with a handful of classes. The feature will allow students and instructors to easily discuss their projects and ask or answer questions, and will be rolled out more widely once we fix the usability problems uncovered with the first few classes. As part of the preparation for this beta test, Sage also created a framework for enabling and disabling features on a course-by-course basis. This will make it easier to gradually roll out and test new features in the future, and may also be useful for A/B testing alternative features and conducting similar research. Behind the scenes, we took the first steps connecting the Dashboard with Salesforce. This effort is aimed at streamlining the way Wiki Ed staff uses and updates course data, automating some of the necessary but tedious data curation tasks that help us track and analyze our programs and outreach efforts. Staff can now easily open a Salesforce record from the Dashboard, and up-to-date course data is automatically pushed to Salesforce on a regular basis. User interface design work kicked off on the upcoming authorship highlighting feature in late February, which we hope to launch sometime in March. This is the first stage of a design sprint with Iván Cruz, the design lead during the Dashboard’s initial development. This design sprint is aimed at refining and polishing many of the features that have been developed in-house in the last year without a dedicated designer involved. During February, Research Fellow Zach McDowell and Research Assistant Mahala Stewart continued analyzing the research data. We have compiled numerous findings from the data, allowing us to connect with multiple researchers and potential conferences for dissemination purposes. In particular, there was significant evidence to support the case that students and instructors find Wikipedia-based assignments more valuable than traditional assignments for learning about writing for a general audience, learning about the reliability of online sources, and for learning digital literacy. Zach is in the midst of assembling a preliminary report to be released soon. Zach has been collaborating with instructors Alexandria Lockett, Cecelia Musselman, Katherine Freedman, and Matthew Vetter on four different writing projects using Wiki Ed’s student learning outcomes data in various ways. Topics include digital literacy, skills transfer, writing contexts and attitudes, and digital citizenship. Zach is also working with another instructor, Joseph Reagle, to submit a proposal to the New Media Consortium summer conference. Wiki Education Foundation staff after a few hours in the clay sculpture lab. Remote staff traveled to San Francisco to join local staff in a four-day All Staff meeting. We celebrated successes of the last four years, reviewed the learnings and accomplishments from the Year of Science initiative, and kicked off the annual planning process for next fiscal year. 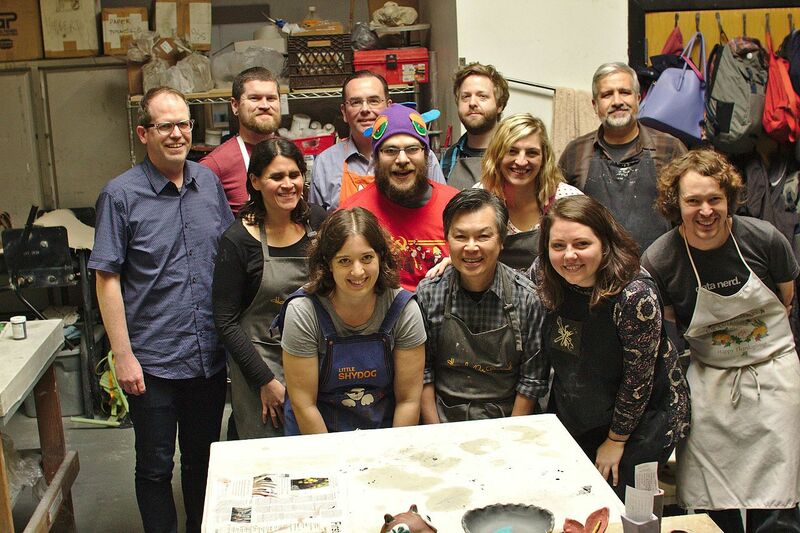 On the final day, staff visited The Crucible, an arts education center in Oakland, where they created clay sculptures. 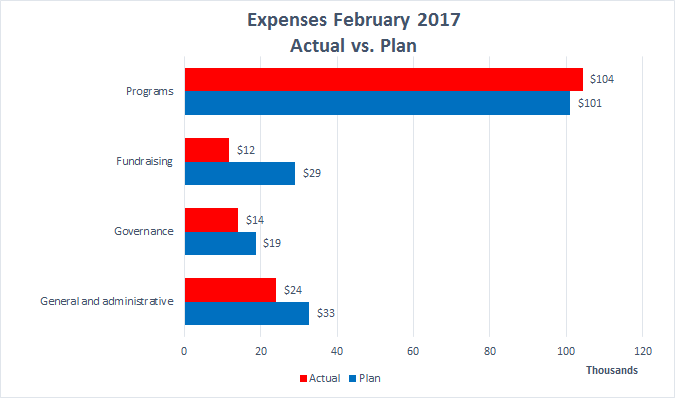 For the month of February, expenses were $154,332 versus the approved budget of $181,390. The majority of the $27k variance continues to be due to staffing vacancies ($20k); as well as the timing of travel ($7k) expenses. Our year-to-date expenses of $1,210,393 was also less than our budgeted expenditures of $1,588,364 by $378k. Like the monthly variance, the year-to-date variance was also impacted by staffing vacancies ($136k). 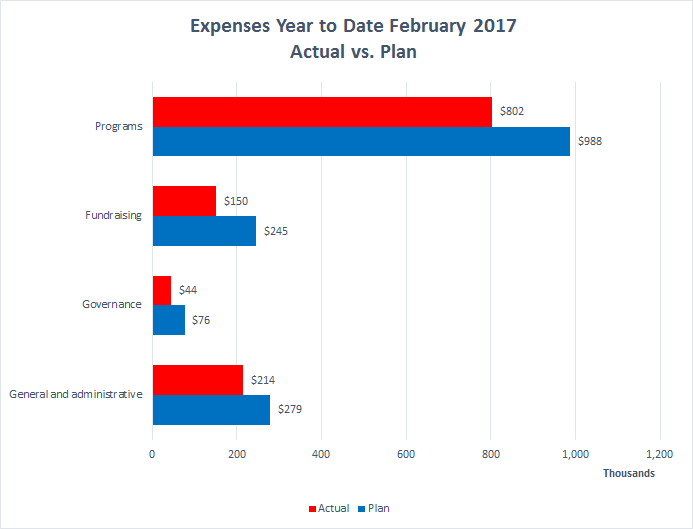 In addition, there were timing and savings of expenditures within professional services ($76k); travel ($85k); marketing and cultivation events ($22k); board and all staff meeting ($44k); and printing ($17k) expenses. In February, Tom Porter accepted a job offer from the Pacific Forest Trust and left Wiki Education. Tom has done a tremendous job, securing multiple grants for Wiki Ed and setting our organization’s fundraising efforts onto a good path for the future. We wish him well for the future. In February, Frank started the process of re-filling the open development position. After the job description got posted, Frank reviewed applications and conducted a couple of first interviews with the most promising candidates. Frank also prepared an outline for a major programmatic campaign to start in the second half of calendar year 2017 and connected with a number of new prospects (both foundations and individuals) to investigate their level of interest in providing funding. Frank started preparing for the second round of the direct mail campaign (targeting high net-worth individuals) that Wiki Ed had started in late 2016. Also in February, Frank started work on streamlining the process for organizing Wiki Ed’s in-person board meetings. Frank had an initial meeting with board member Ted Yang for preparing the next iteration of Wiki Ed’s strategic planning process that’s expected to start in the second half of 2017.